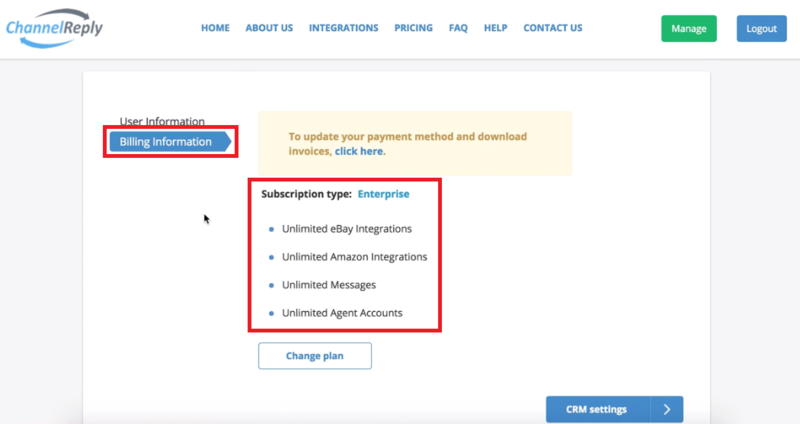 Need to change your ChannelReply subscription or payment plan? Both this article and the video below explain how it's done. Let's find out how the User Information tab of your account management interface works. Notes: Click on any screenshot to see the full-sized image. Article last updated 12/19/2018, video last updated 10/14/2016. What's the Point of the User Information Tab and Where Can I Find It? You don’t have to worry about this tab during your free trial of ChannelReply. However, once you’re ready to manage a paid account, you can handle it all from here. We’ll explain the User Information tab in two parts: creating and managing a new account, and reactivating a canceled one. Keep reading to learn about creating a new account or skip to reactivating a canceled account here. 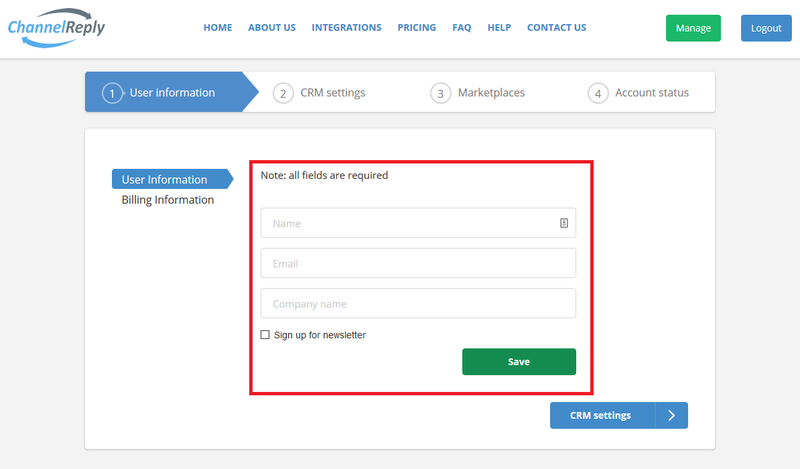 On the User Information page, you can change the name, email address, and company name associated with your account, as well as your newsletter subscription status. Remember to click “Save” after you make any changes. If you change your email address, you will need to use the new address to log in to ChannelReply from now on. Your password will stay the same. Note that your new address will also receive your account notifications, such as message limit warnings. 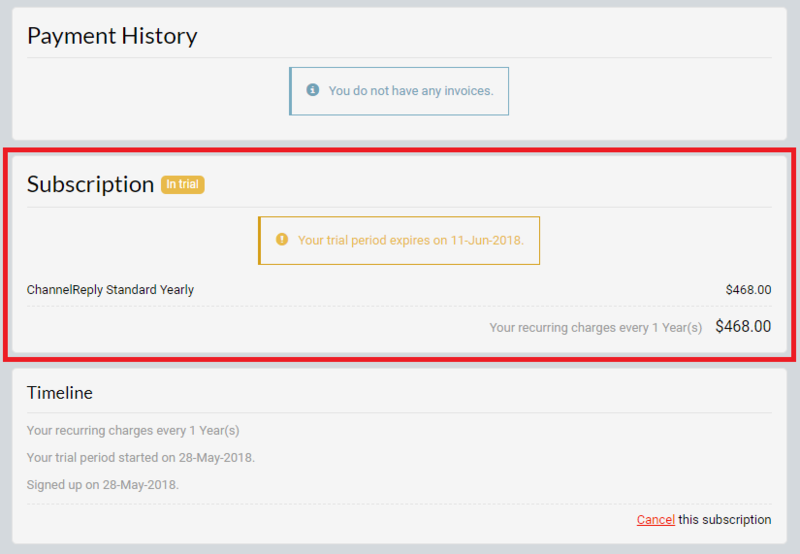 Billing notifications will continue going to your old address unless changed in the Chargebee payment portal (described below). 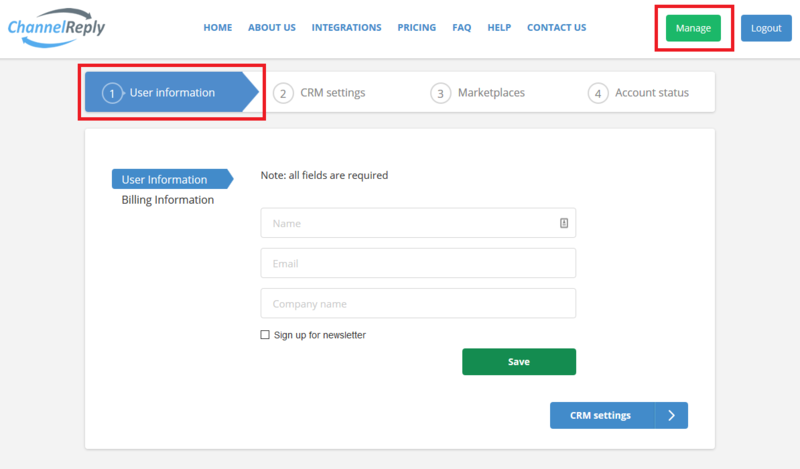 You can manage your subscription and billing info on the Billing Information page. 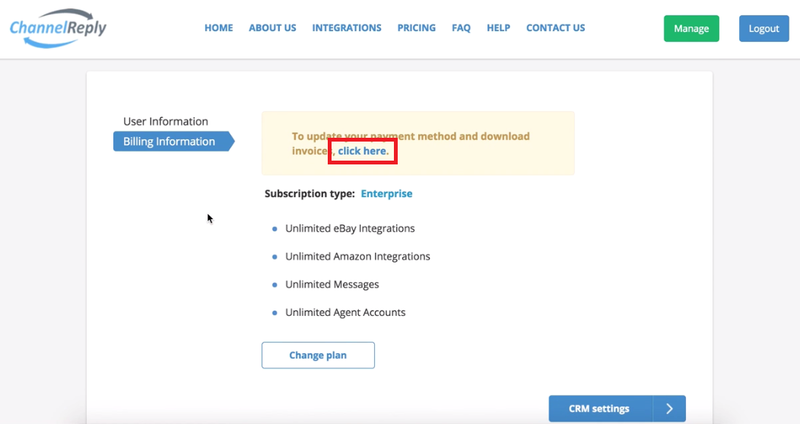 There you will see your current subscription type, along with the max numbers of eBay and Amazon integrations, monthly messages, and agent accounts you can have with that subscription. 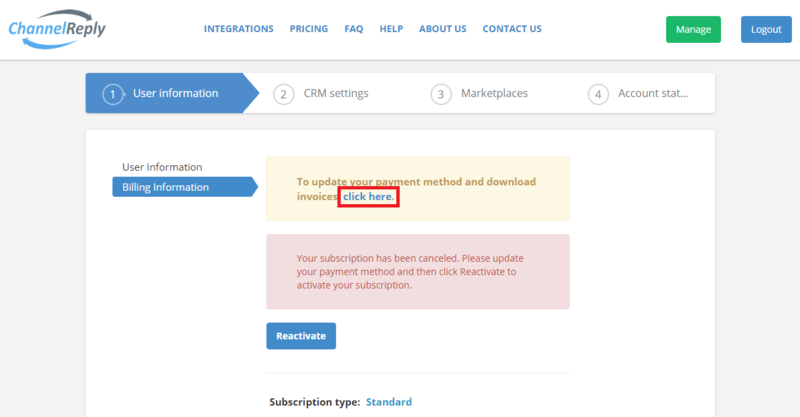 To access the Chargebee payment portal and add or update payment information, click the blue “click here” text. Change the name and email address used for billing purposes under Account Information. 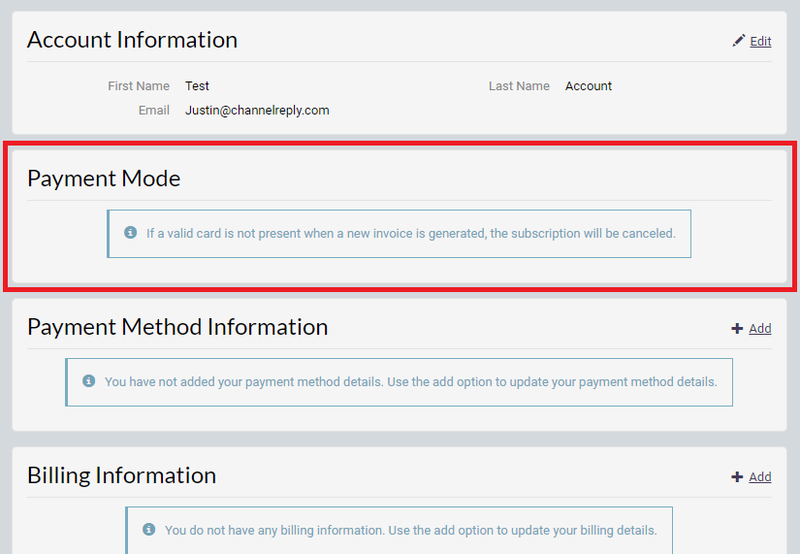 Check whether you have automatic payments set up under Payment Mode. 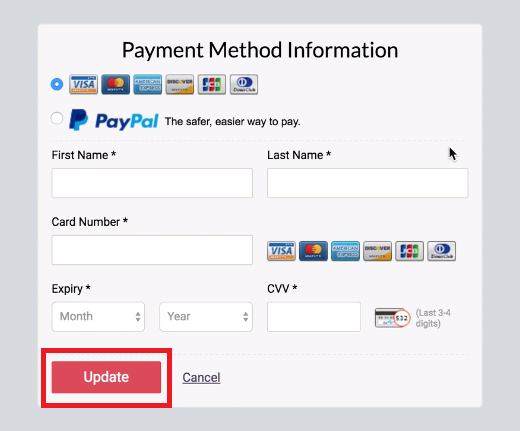 Review any payment method you have added, or add a new method, under Payment Method Information. 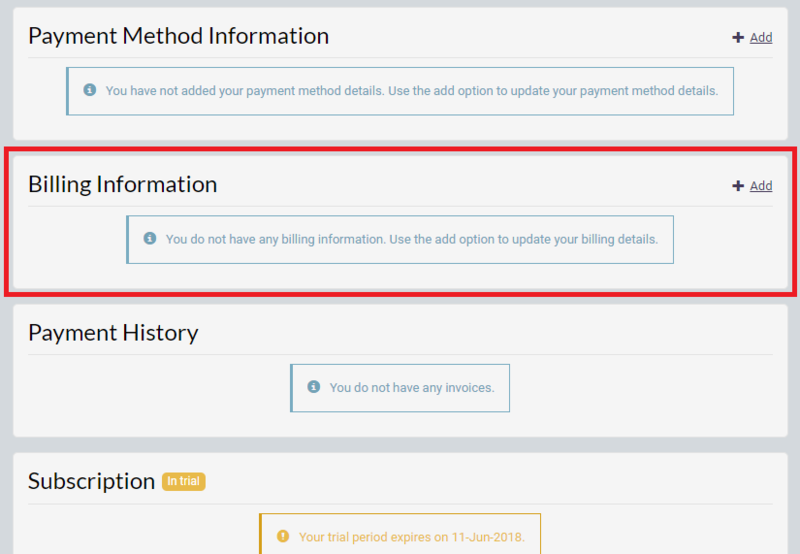 Enter and update your billing address and related info under Billing Information. Keep track of your invoices under Payment History. Get a snapshot of your account history and find the option to cancel under Timeline. Afterwards, click “Logout” to return to your ChannelReply account. 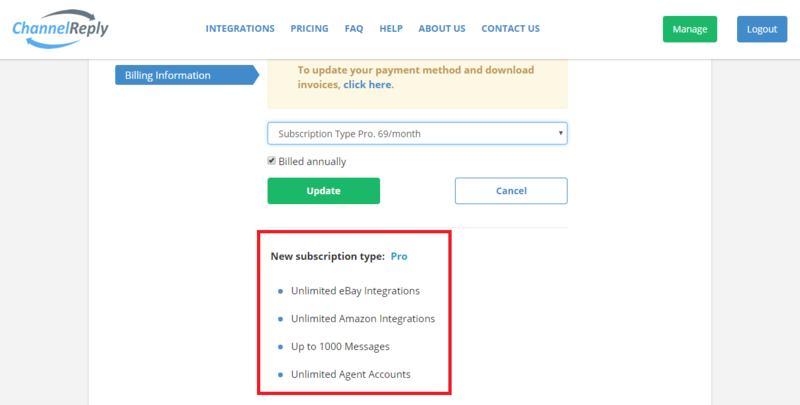 Click on the “Choose new subscription type” dropdown to select the kind of subscription you want. The maximums for the selected account type will be displayed below. 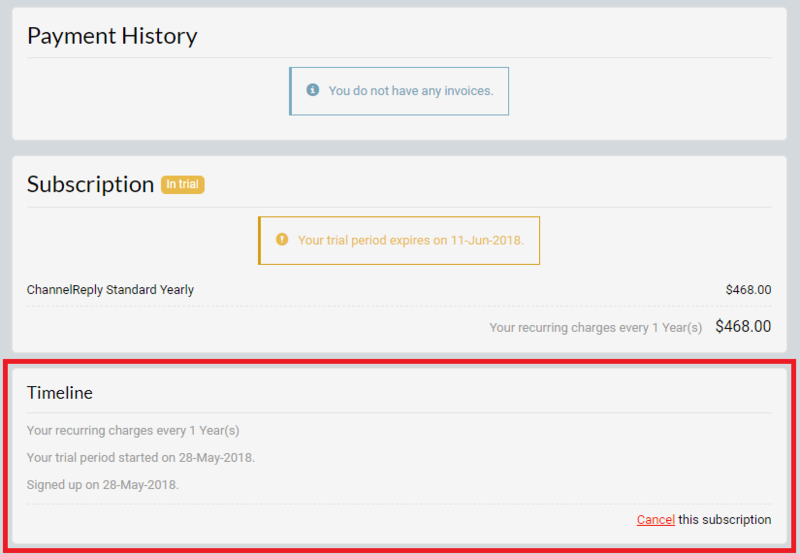 Uncheck “Billed annually” if you’d prefer a monthly billing option. The pricing shown will change accordingly. You’ll get a significant discount if you choose annual billing! 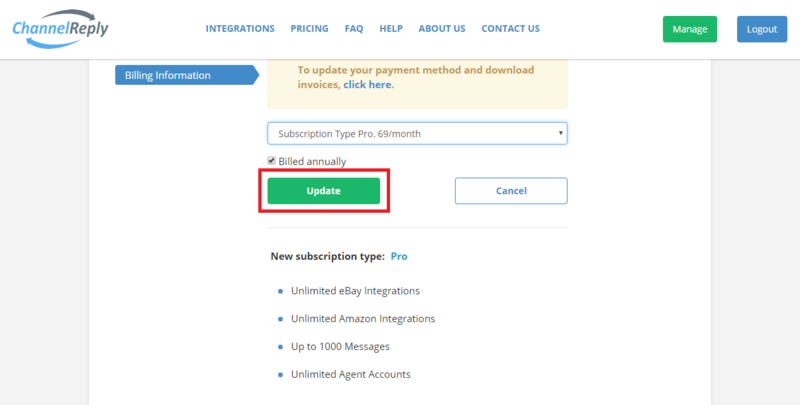 Click “Update” when you’re happy with your new subscription type. Congratulations! Your user information, billing, and subscription are all taken care of. 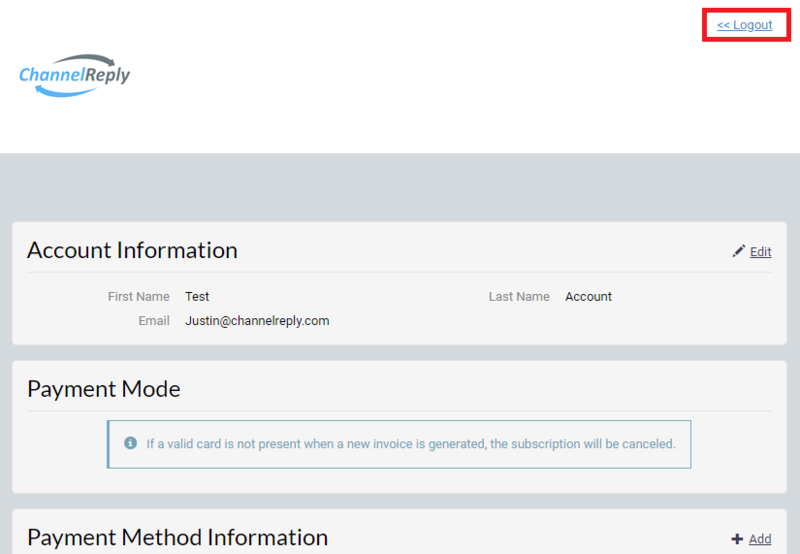 It’s easy to reactivate a canceled ChannelReply account. To get started, click “Sign In” on the ChannelReply homepage. Log in to your old account when prompted. You’ll land on the Billing Information page and see a notification warning you that your subscription has been canceled. You may notice that you can’t click through to any other pages or tabs within the account management interface. You won’t be able to visit any of these other pages until your account is reactivated, but you can, of course, still visit important pages like Help or Contact Us. 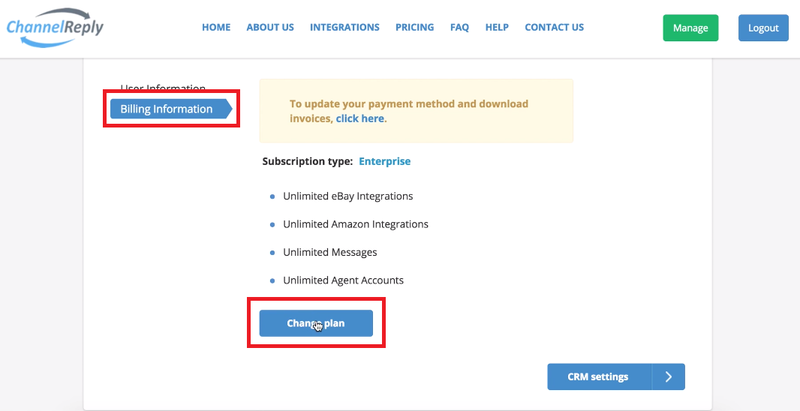 Click the blue “click here” text to visit our ChargeBee portal and begin reactivating your account. You can find a full explanation of the ChargeBee portal in Part 1 of these instructions. 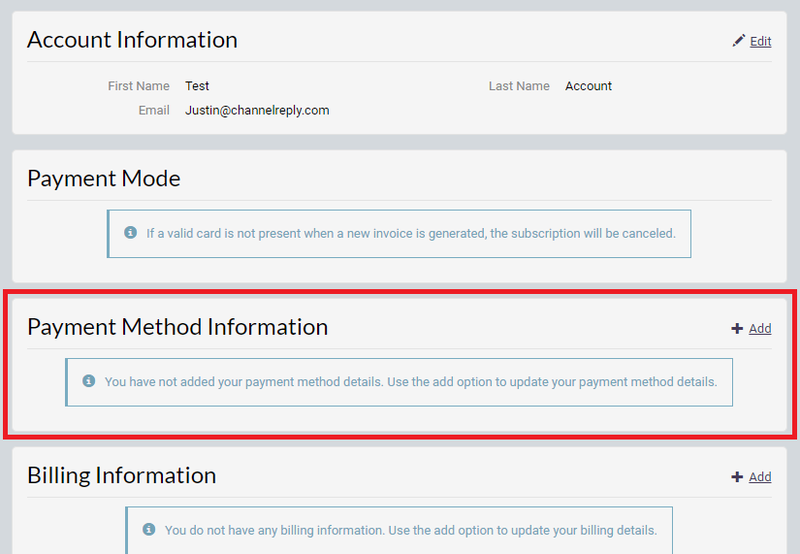 For now, just look for “Payment Method Information.” Click “Add” on the right side. Next, click “Logout” to return to your ChannelReply account. Once you’re happy with your payment method information, you’ll want to make sure you have the right subscription type chosen as well. Scroll down and click the “Change plan” button if you aren’t happy with the currently selected plan. Click “Choose new subscription type” to see the different options and prices. 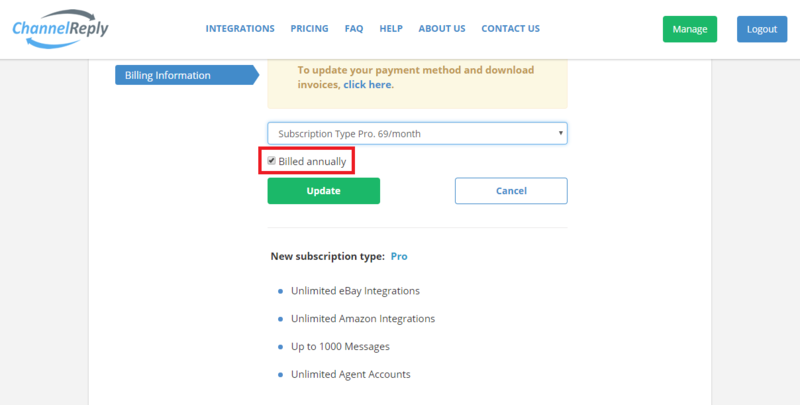 The details for the subscription type will appear below once you select one. 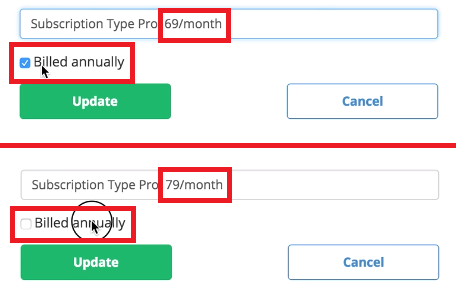 The pricing shown will also change to reflect whether you have the “billed annually” box checked off. Click “Update” to confirm your changes. Alternatively, click “Cancel” to return. Once you are happy with your payment information and subscription, click “Reactivate” and you’ll have full access to ChannelReply once again. Congratulations on setting up your ChannelReply subscription! If you ever get stuck, please don’t hesitate to contact us.